A rather ill-thought-out retail display in a Queensland chemist that featured “golliwog” dolls under a banner that read “Experience a white Christmas” has been slammed by Aboriginal leaders The Sunshine Coast Daily is reporting. 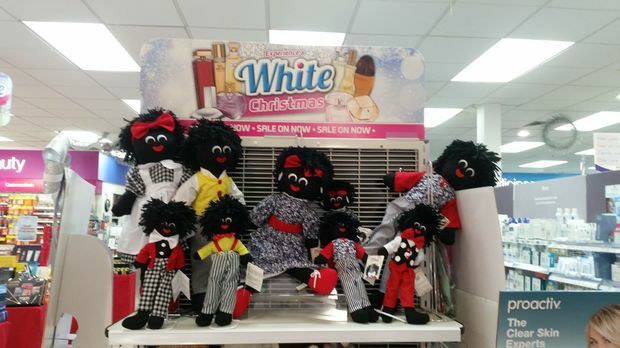 The display, in a Terry White Chemist in Toowoomba, featured nine rag dolls that have long been slammed as a racist caricature of people of colour. Aboriginal activist, author and filmmaker, Dr Stephen Hagan, told the newspaper the entire incident was shameful and described the city of Toowoomba as the “most racist city in Australia”. He added: “There is an underlying bigotry in Toowoomba that has permeated the consciousness of xenophobia within the community – it’s a bad situation. Education is the main tool to combat racism. “It’s hard when people make racist jokes around the dining room table, and others condone it. Words can’t describe this behaviour in the 21st century. I can understand it in the 1960s but to do it today is inexcusable,” Hagan said. A Terry White staff member told the The Sunshine Coast Daily that the display was not intended to offend and would be removed.